Lorena came to our house for Christmas when I was eleven years old. Before she arrived, my mother explained to me that she was pregnant with my cousinâ€™s child, she spoke almost no English, and I was supposed to ignore both of these facts during the course of the day. She had come to Iowa from El Salvador to work at the local egg processing plant. She wasnâ€™t alone. Our nearly all white rural community watched somewhat hostilely as waves of Central Americans moved in, overwhelming the schools and businesses with the Spanish language and culture. Now we were going to have one in our family, and actually in our home. She was beautiful, and fascinating, and she never spoke a word. I figured she had to be pretty uncomfortable.Â My large, loud family spends holidays taking political banter to the level of assured mutual destruction. Sitting silently in the corner of our living room, she looked like an alarmed spectator witnessing her first professional wrestling match. As I stole glances in her direction, my longing to know her warred with feelings of inadequacy. I didnâ€™t speak Spanish. Even my cousin, her future husband and the father of her unborn child, was still learning. I wanted to joke with her, to make her feel like part of our raucous clan, but we couldnâ€™t get past the level of â€œthank youâ€ and â€œhello.â€ Instead of hugging her at the end of the day, I gave her an awkward little wave and felt like a failure. I remember thinking I would understand if she never came back. She did return, and has spent every Christmas at our house for the past ten years. My cousin became fluent in Spanish, and translated for her until she mastered English. She became the part of the family I was so afraid she wouldnâ€™t be. She laughs good naturedly with us when my grandma spills her water (as she does every year), and scolds my uncle for cheating at cards. Lorena surprised us all three years ago by announcing that she had a 13-year-old son in El Salvador. Unable to afford to care for him while looking for work, she had left Ricardo with his grandmother. After saving for years, she and my cousin were bringing him to America, and their family would be complete. 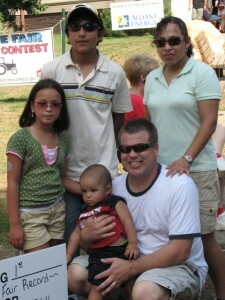 Like Lorena before him, he spoke no English, but his parents helped us communicate. His first Christmas, Lorena confided in me that she was worried he hated life here. In El Salvador, he had been a standout soccer player and showed promise in math. In rural Iowa, the only futbol we played involved tackles and pads, and even the language of numbers wasnâ€™t translating.Â She admitted how hard it was for her to assimilate, and she hadn’t been thrown into the angst-ridden environment of middle school. Just a few weeks ago, Lorena and I squinted into the September sun as we watched Ricardo help his little sister board a carnival ride. As I watched him converse in easy English with the operator, I asked Lorena how he is liking his sophomore year in high school. She paused for a moment, watching the interaction between her son from one world and her daughter from another, and then looked at me with a joyous grin.